A Belfast woman who has been undergoing treatment for cancer has become the single biggest winner of the lottery since it began 10 years ago. Iris Jeffrey, 58, bought the ticket on 14 July but only realised she had hit the jackpot on Wednesday evening after hearing an appeal by lottery organisers Camelot. She scooped the biggest single National Lottery jackpot of £20.1m. The married mother of two grown up daughters is about to become a grandmother in a few weeks. She said one of her first purchases would have to be a new washing machine. At a news conference on Friday, Mrs Jeffrey said the delay in claiming her prize was down to her forgetting about the ticket. "I watched the news on television and the numbers came on. I checked them later on but I forgot all about the ticket," she said. "I didn't believe it actually. My daughters checked the ticket for me. Asked how she reacted once she realised she had won she said: "I had a glass of milk and went to bed." Mrs Jeffrey said taking care of her family and friends was her first priority. "I am going to make sure that my family and friends are secure for life," she said. She plans to buy her 62-year-old husband Robert a new car and is looking forward to spoiling her new grandchild when he or she comes along. She added that she hoped it would not change her too much and said she had no plans to leave her terraced home. However, she said: "I might go to Blackpool for five days". The north Belfast woman is being treated for cancer of the gullet and her family have said they are hoping to look at the possibility of further treatments. "I am being treated for cancer at the moment so I am undergoing chemotherapy and I will be having a major operation - hopefully next month," she said. "We are so glad she has got this because it will make life easier for her given her medical condition," said Iris' daughter Wendy. "That will solve a lot of problems and hopefully it will bring about a speedier recovery." The winning numbers were 6, 27, 33, 38, 45, 47. Camelot was keen for the winner to collect their prize as they were missing out on £2,200 a day in interest. To date, former Belfast bus driver Peter Lavery was the biggest lottery winner from Northern Ireland. He won more than £10m in 1996. 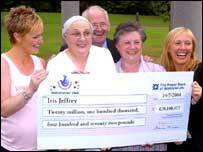 "This is one brave lady"
Can a lottery win make you happy?